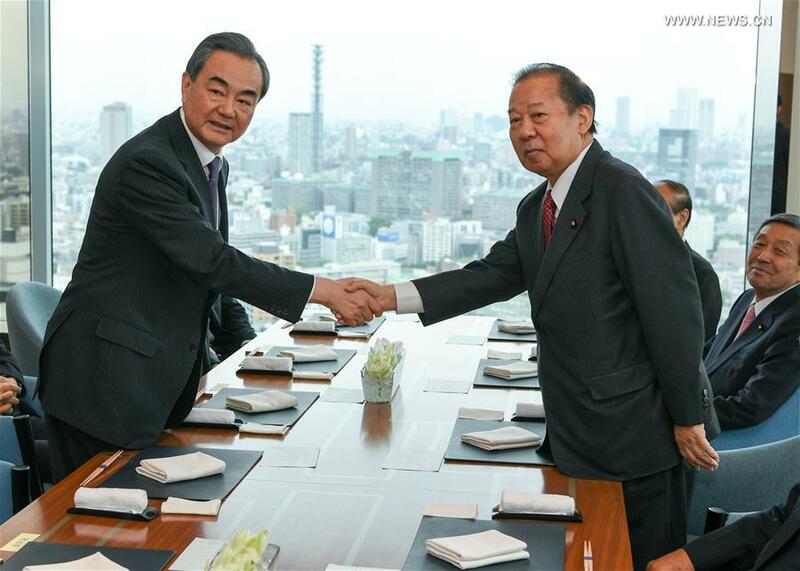 TOKYO, April 17 (Xinhua) -- Chinese State Councilor and Foreign Minister Wang Yi met with Toshihiro Nikai, secretary-general of Japan's ruling Liberal Democratic Party (LDP) here on Tuesday. During the meeting, Wang said that the Japanese government has sent some important and positive messages on enhancing its relationship with China, and China has made joint efforts with Japan to push bilateral relationship for improvement and development in the right direction. The two sides should cherish the current good momentum which does not come easily, and implement with concrete actions the consensus of treating each other as cooperative partner instead of a threat so as to promote sustainable and stable development of bilateral relations, Wang said. He added that exchanges between political parties and politicians have been an important part of political exchanges of the two countries, while people-to-people exchanges have been an important driving force for the development of bilateral ties. He hoped that Nikai would continue to play a positive role in bringing more people in Japan to support the development of relations between China and Japan, especially more young people to participate in the China-Japan friendship cause. Nikai, for his part, said that stable, peaceful and friendly bilateral relationship is very important, and the two sides should continue to deepen people-to-people exchanges, promote mutual understanding and trust between political parties and politicians of the two countries to create a sound external environment and solid foundation of public opinion for the improvement of bilateral relationship. During his visit, Wang also met with former Japanese Prime Minister Yasuo Fukuda and some lawmakers of the LDP.